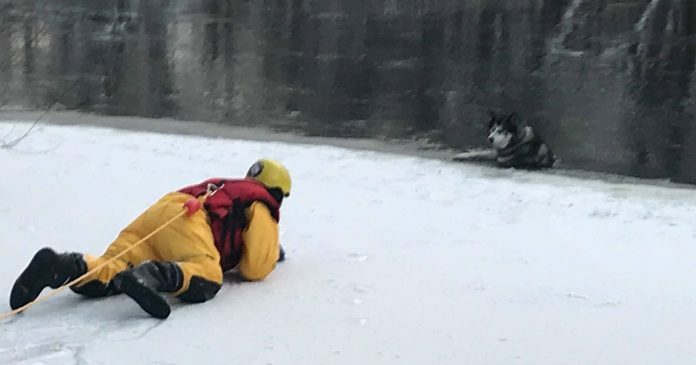 MEQUON, Wis. (AP) — Authorities say a dog that fell into the freezing waters of a Wisconsin river clung to an ice ledge for about 10 minutes before he was rescued. The Journal Sentinel reports that the 6-year-old Siberian husky, Odin, got loose from his yard in Mequon, about 15 miles (24 kilometers) north of Milwaukee, and wandered onto the icy Milwaukee River about 4 p.m. Thursday. A Mequon firefighter, equipped with ice rescue equipment, crawled out to the water and grabbed Odin by the collar. The dog’s owner, Margaux Caffa, headed to the river after she realized Odin was missing and could hear him yelping. She followed the noise to the river bank, spotted the dog and called 911. Firefighters said Caffa made the right choice by not trying the rescue attempt herself. Previous articleQ&A: How soon will the federal government get back in order?